Atop the delightfully named Mingfeng or “Singing Phoenix” Hill in Kunming’s Jindian Park sits the majestic Golden Temple. It is the most famous Taoist temple in China not only because of its tranquil setting and impressive size, but predominantly because it is the largest bronze temple in China. From the doors to the roof tiles, everything in the temple has been made entirely out of bronze! 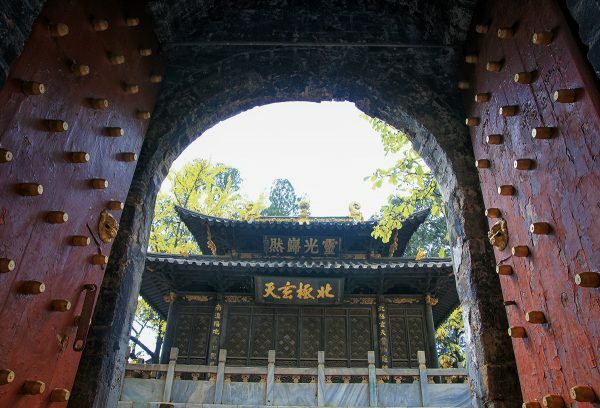 Its official name is Taihe Palace or the Hall of Supreme Harmony, but its glittering appearance has earned it the names Tongwa or “Bronze Tile” Temple and the Golden Temple. Made from a whopping 250 tonnes of bronze, the Golden Temple is an architectural wonder unmatched throughout China. The history of the Golden Temple stretches all the way back to the Ming dynasty (1368-1644), during the reign of the Wanli Emperor (1572-1620), when it was initially built almost by accident. The imperial government had ordered Yunnan province to send large quantities of bronze ore from its mines in Dongchuan to Central China so that it could be used to make coins. However, on the long and arduous path to the mint, the roads were made impassable due to the on-going wars at the time, so the cargo was trapped in Kunming. The governor of Yunnan, Chen Yongbing, was a devout Taoist and ordered that the bronze ore be used to build a replica of the Golden Temple in the Wudang Mountains of Hubei province. The replica was promptly built but bizarrely, in 1637, Yongbing’s temple was moved for political reasons to the Jizu Mountains of western Yunnan, leaving behind only the marble base. If you think your workout at the gym is hard, imagine moving a 250-tonne solid bronze temple up a mountain! It wasn’t until 1671, during the Qing dynasty (1644-1912), that Wu Sangui, the then governor of Yunnan, decided to build yet another replica of Yongbing’s Golden Temple on the old marble base that was left behind in Kunming. We have to believe that if a temple is so great it’s worth building three times, then it’s definitely worth a visit! Whilst the original temple in the Jizu Mountains sustained irreparable damage in the 1960s, the Golden Temple in Kunming stands tall to this day. It was damaged slightly during the Muslim rebellion in 1857, but since its restoration in 1890 it has remained largely unchanged. Its walls, columns, rafters, roof tiles, altars, statues, decorations and banners are all made from bronze, and have dazzled visitors with their beauty to this day. Nowadays, if you want to visit the Golden Temple you must first scale the many marble steps of Mingfeng Hill and pass through a series of Heavenly Gates. The three Heavenly Gates that lead directly into the temple are considered the most beautiful, as they have been intricately decorated and painted. After your long and, hopefully, rather spiritual trial up the hill, you’ll come upon a miniature, medieval city wall raised on a platform. Near to this wall, the Lingxing Gate marks the entrance to the temple. In the temple itself, you’ll find a number of fascinating artefacts relating to the history of the temple, including a double-edged sword with the Big Dipper engraved on it. This sword, which weighs more than 22 kilograms (44 pounds), is supposedly the legendary magical sword of the Taoist deity Zhen Wu, who is said to guard Mingfeng Hill. Alongside this colossal sword, Wu Sangui’s 12-kilogram (25 pound) broadsword seems markedly less impressive. Next to the temple, there’s a stunningly beautiful camellia tree that has signalled the approach of Spring every year for over 600 years. Every time this ancient tree blossoms, its burst of colour is no less magnificent. Just behind the temple, you’ll find a three-storey high Bell Tower that was built in 1984. Although the tower itself is rather new, it is home to the “Great Bell of the Ming Yongle Era”, which is over 580 years old. This bell is nearly 4 metres (17 ft.) high and weighs a monumental 14 tonnes. It once hung in the Xuanhua Mansion and was used to announce the time, but was moved to the temple when the city of Kunming began expanding. We’re not 100% sure, but we’re pretty certain that every bell ringer unfortunate enough to work in the Xuanhua Mansion must have gone deaf rather fast. In recent years, the temple has been expanded to include the Parrot Garden, Camellia Garden, and Orchid Garden. Its verdant hillsides and blooming orchards play host to a multitude of pine trees, evergreens, hardy cypresses, and other plants, all helping to earn it the nickname the “Fairyland of Mingfeng”. No matter what you find here, be it historical knowledge, spiritual enlightenment, inner peace, or just a very big bell, we’re sure you’ll enjoy your trip to the Golden Temple.